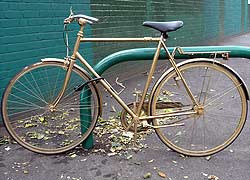 We stopped to admire this all-gold bike parked on Long Lane the other day. Shame about the saddle - perhaps they could source a gold Brooks on eBay? We hope the owners are preparing an all-silver and all-bronze model for the 2012 Olympics too.